Hamburg is not a place that had previously appeared on my radar; I didn’t think of it as a traditional holiday destination and, as I have never been on a stag do, the adult entertainment of the Reeperbahn remained unknown. What I did know was that it is an up-and-coming short-break destination that is increasingly on the radar for Brits. But the question remained: Was Hamburg suitable for families? And if so, could VIP and I keep two tech-addicted tweens amused in the city for long enough without breaking the bank? So off we went to find out! 1. Get yourself a Hamburg Card! First things first, make sure you get yourself a Hamburg Card. There are a few reasons many cities around the world offer the city cards: they have a number of advantages including the opportunity to save yourself a lot of money. The Hamburg Card costs from €9.90 and offers free travel by bus, train and ferry and up to 50% on around 150 offers including museums, theatres, restaurants and attractions. TOP TIP: Don’t forget to ask in cafés and restaurants if they accept the Hamburg card to receive a discount – if you don’t ask, you don’t get! A great way to keep costs down is to stay in serviced apartments rather than a hotel. We stayed at the appartello hotel – about 30 minutes outside of the city and used our Hamburg Card to get into and around the city. The opportunity to buy affordable food/drink for breakfast and during the evening. 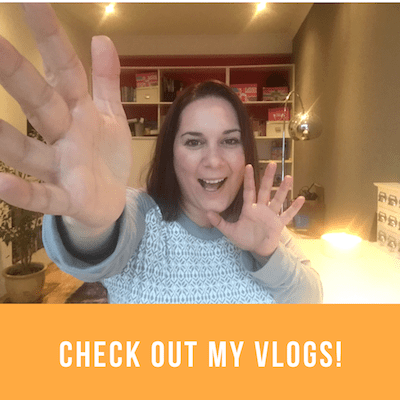 The opportunity to get your own space (it was a godsend!) as the apartment offered a separate room. After a long day with the kids, it’s nice to put them in one room to relax and watch the TV, while you had the advantage of a separate room. The appartello has a range of offers including its two-night autumn sale which offers two nights’ stay, breakfast and a harbour boat trip from a very affordable €99.50. TOP TIP: Get yourself acquainted with Lidl – just round the corner from the hotel – to help keep food costs down. 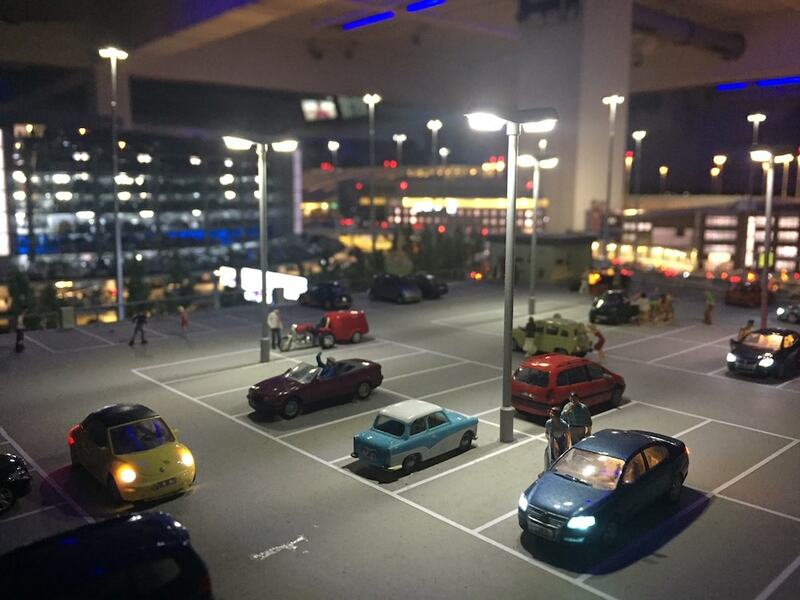 If you like all things mini, then you’ll absolutely love Miniatur Wunderland. The attraction offers a total of nine areas, ranging from Switzerland and America to Scandinavia and Hamburg city itself, including a very cool replica of its airport with planes landing and taking off! The exhibition offers 1,300 trains with more than 15km of track, over 100,000 moving vehicles, nearly half a million lights and around 400,000 human figures. What particularly impressed me was that you could experience day and night at the attraction; at timed intervals, the main lights would dim and the exhibits would come alive with little tiny lights. Definitely worth a see is the erupting volcano, which kids will love. I personally took hundreds of photos of the exhibits – and would love to go back as I know there were scenes that I didn’t manage to fully take in the first time round. The attraction is actually undergoing expansion, with new areas such as Venice later this year, Monaco in 2019 and longer-term, Great Britain and Scotland – due for completion in 2021. There is a section where you can watch the creators and artists work, which is fascinating to watch as you can see that their attention to detail is impeccable. For what you get to see, the prices are pretty good – €13 for adults and €6.50 for kids. Well worth the money – but it’s advisable to book tickets first – we would have had a 170-minute wait had we bought tickets on arrival, which shows how popular it is. TOP TIP: As you go in you can pick up an activity leaflet for kids, where you can try and spot scenes from the dioramas throughout the exhibition. Oh, and make sure you have enough memory on your camera…you’ll be taking lots of pictures! Take a walk along near Hamburg’s riverside and you’ll see plenty of opportunities to jump on a tour bus. There are short rides to long (round-trip) options, and on some of the tours (Line A for example), you are also given headsets to be able to listen to commentary in English. 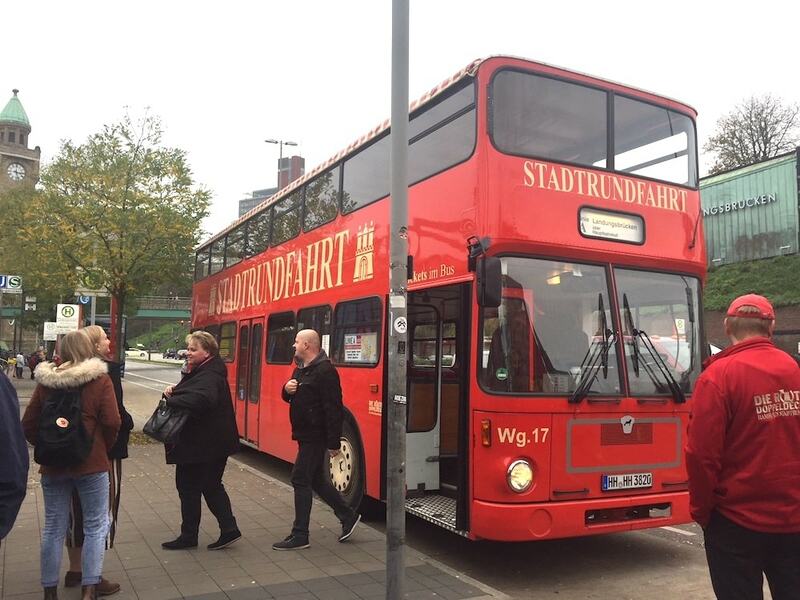 The bus tour is fascinating – you learn plenty of interesting facts and figures about Hamburg and its history, plus the bus ventures into the suburbs to give you a flavour for what awaits beyond the tall buildings. The city’s TV Tower was built in 1968 and is 279m high. Shops in city centre are usually open from 9am-8pm Monday to Saturday but on Sunday shops are generally closed. 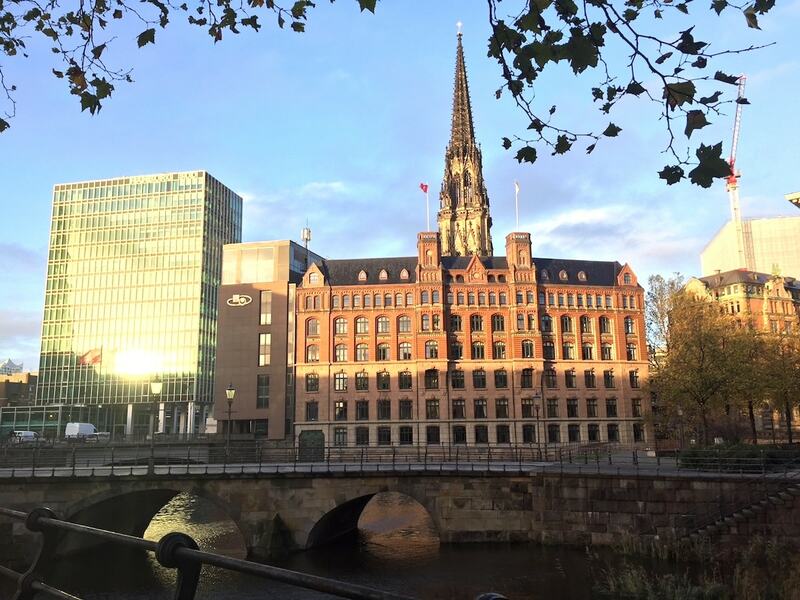 Hamburg is home to the world’s oldest insurance company, which opened in 1676. Cruising was invented in Hamburg! Its underground system was built in 1912 and is the fifth oldest in Europe. Hamburg has 2,500 bridges and is often referred to as the ‘Venice of the North’ – it actually has more bridges than Venice and Amsterdam combined. 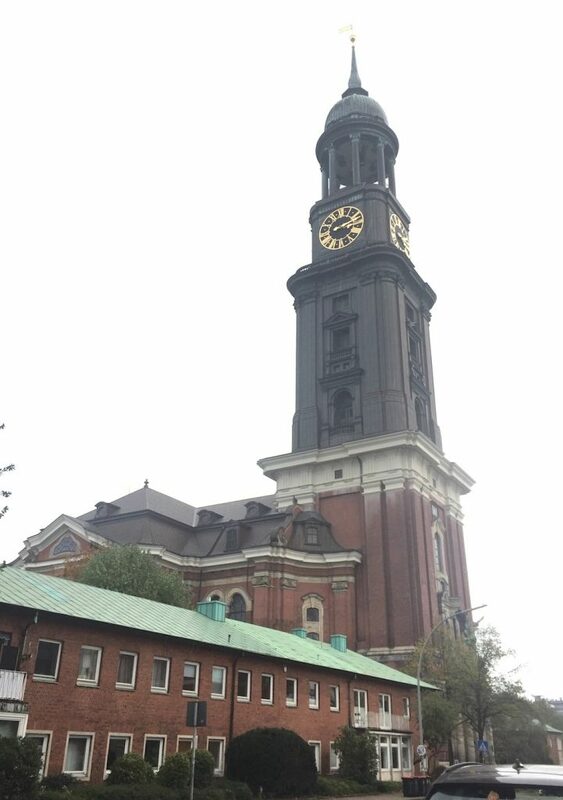 One of the most important significant landmarks – The Michel is the largest church in north Germany (we climbed it). It has burnt down twice and been rebuilt. For the Line A Sightseeing Tour, kids under the age of 14 go free, while the price is €17.50 per adult, unless you have a Hamburg card, in which case it’s €15. A family ticket costs €33. TOP TIP: You can see all 29 stops on the Line A tour, which gives you a fantastic overview of the city and its geography, or you can choose to hop-on and hop-off at some of the city’s main shopping & entertainment hotspots. While you’re close to the River Elbe for the bus tour, you can grab lunch on the waterfront and then hop onboard one of the many boat tours. We opted for a Barkassen Meyer harbour boat tour (which offers daily departures between 11:00-15:00) with departures on the hour. It takes in the main sights and the cruise lasts about an hour with prices from €18 per adult and €9 per child up to 14. Children up to four are free and there are discounts for families with prices on application. Alternatively, if you’ve got a Hamburg Card, the ferry is free and will give you a mini tour of the city. It departs every 15 minutes and takes around 30 minutes to do a round-trip. TOP TIP: Get there early to get a good seat, otherwise you’ll end up having to sit inside and might not see as much as you do from outside. From one chocoholic to another, you will love this place. What’s great is that there are plenty of opportunities for chocolate tasting, plus you’ll also get the chance to make your own chocolate, decorate it and keep it too! 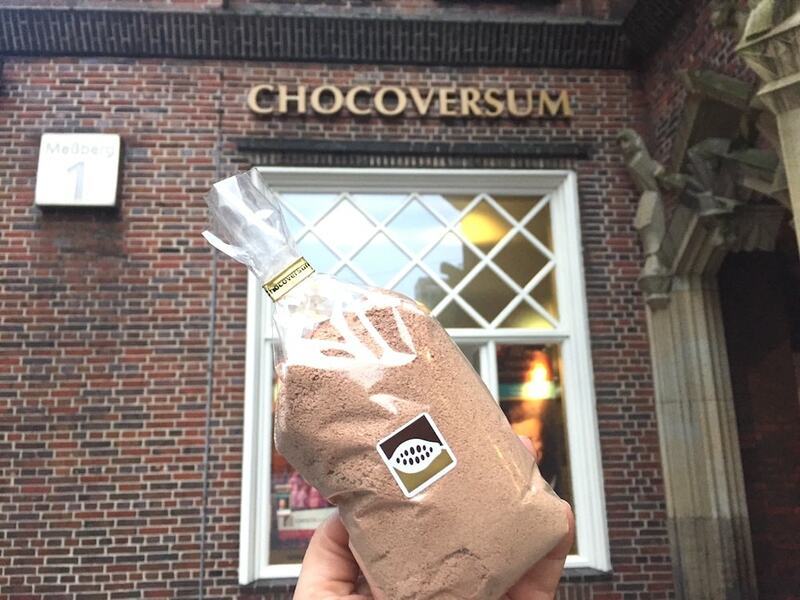 What I also loved about the Chocolate Museum (Chocoversum by Hachez) was that it was educational. 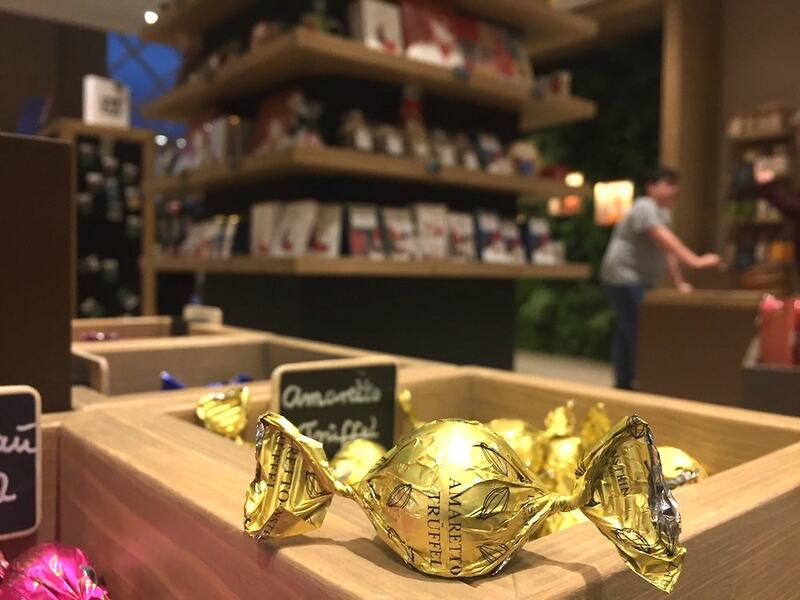 We heard about how chocolate differs immensely and what constitutes great quality chocolate; and where it comes from (most is from destinations in Africa such as Ghana and the Ivory coast – who export around 72% of the world’s chocolate). And the best way to eat and taste chocolate? Rest it on the back of your tongue and let it melt! Well, I don’t know about you, but I’d find this pretty hard – the chocolate I scoff does a disappearing act in a nano-second. While we were on the tour we got to try some powder chocolate called Walzgut – it was so amazing that I vowed there and then to buy some – and I did. Prices are €15 for adults and €11 for children up to 17 years, but you get 20% off with the Hamburg card. TOP TIP: Try to be one of the first to get your chocolate bar decorated with the confectionary – otherwise you may end up back of the queue and rushing to get it done. One of the most important landmarks in Hamburg is St Michaelis (or Michel to the locals), which is the largest church in north Germany. The church, which has burnt down twice in its history and been rebuilt, is 132 metres tall to the top of its spire, and is as much a part of Hamburg’s skyline as the Eiffel Tower is to Paris. 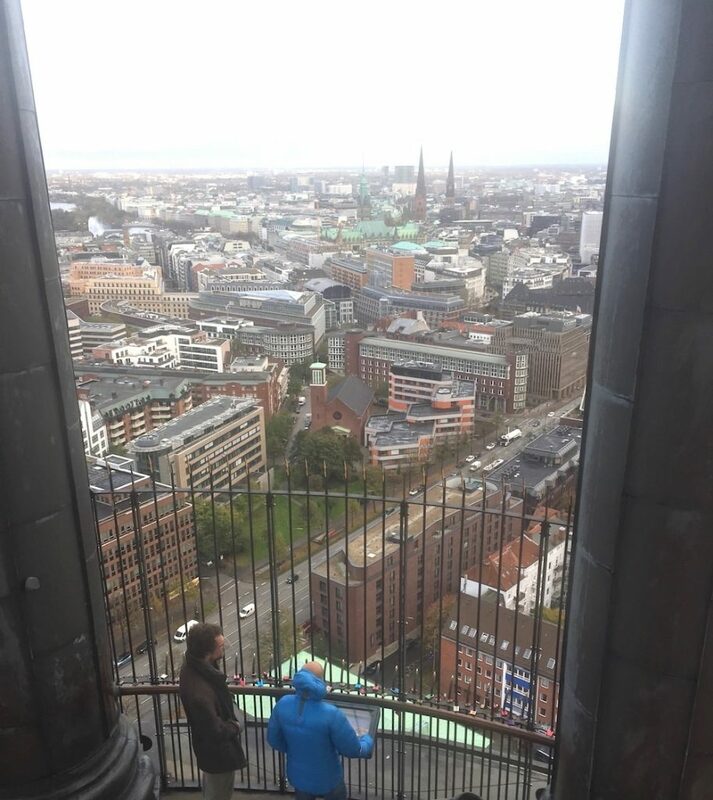 The inside of the baroque church is simply breathtaking, but not maybe as breathtaking as climbing all 400+ steps to the viewing platform near the top. If the kids are young, you might want to opt for the lift instead. Either way, when you reach the top, you are rewarded by panoramic views of the city and the harbour from 106 metres high. Definitely worth a visit. Prices are €5 for adults and €3.50 for kids – but you get a discount if you’ve got the Hamburg Card! TOP TIP: If you got a five-cent coin, use it in the machine (on the viewing platform) to get the kids a commemorative coin. It’s a nice little keepsake of your holiday! And wrap up for this activity – it can get a bit windy and cold up there! One thing I noticed was that there were a few souvenir shops in Hamburg – which is never a bad thing if you’re looking at a keepsake for your trip. 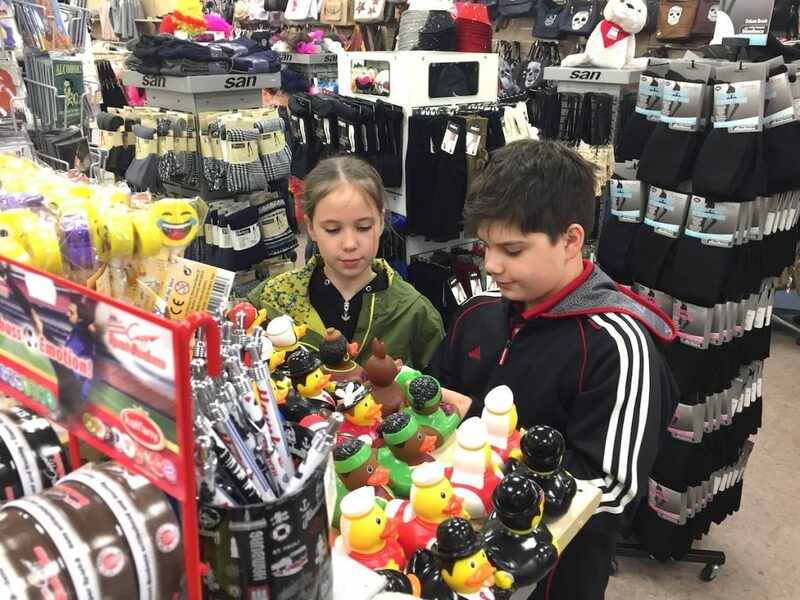 The Reeperbahn has plenty of (cheaper) souvenir shops and the kids are bound to find something to remember their city break holiday, while you are also likely to find a suitable memento for the family back home. St.Pauli/Reeperbahn is probably the city’s most famous area. Reeperbahn (known as the sinful Mile) is also the red light district. However, go there during the day and you’ll also find the Beatles museum as well as lots of other clubs, musical and theatre entertainment. TOP TIP: There are a lot of personalised souvenir mugs/cups in Hamburg and some of them are really unique – a nice, practical pressie for the kids to keep perhaps? 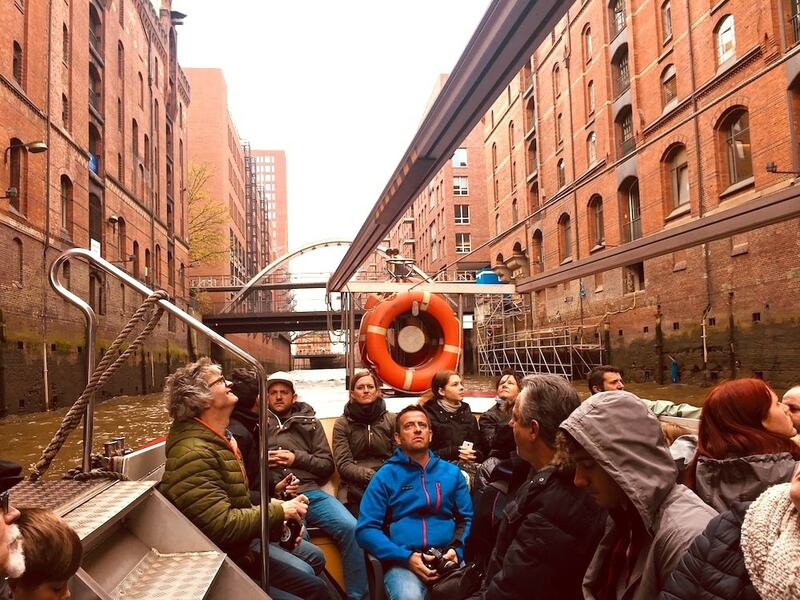 Hamburg’s historic Speicherstadt (warehouse district) looks pretty impressive – on foot and by boat – and the red brick buildings provide a stunning backdrop to the River Elbe. The Speicherstadt is the largest warehouse district in the world, spanning more than 1.5km in length and covers an area of more than 26 hectares. And because of such impressive figures, it has been named a UNESCO World Heritage site. It was built between 1883 and 1927 and the warehouses once housed anything from spices and cocoa, to exquisite rugs and coffee! 10. When in Hamburg…..eat a hamburger! 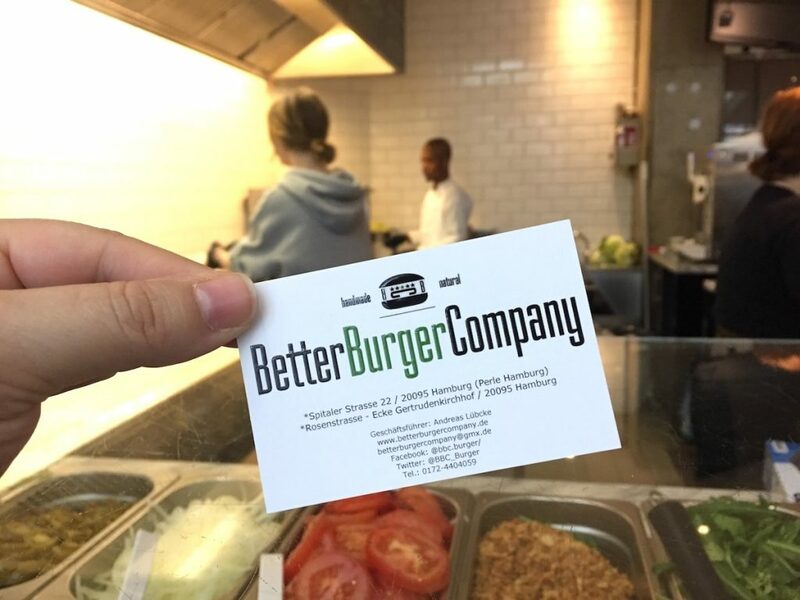 There’s a great place to eat called the Better Burger Company; in fact it’s a chain restaurant that allows you to build your own burger. And the food tastes delicious. Kids will love seeing the burger ingredients in display cabinets, which they can point to when designing their bespoke burger – and the big chunky chips are definitely worth a try too. TOP TIP: Try to see if you can spot the chef making the patties – the kids will be mesmerised with how their burger is made from scratch! 11. Go on your own walking tour! Hamburg is a place of discovery. Although there are free, guided walking tours available, they seem more geared towards adults – and kids might tire easily. So it’s a great idea just to go for a wander to see what you can find. 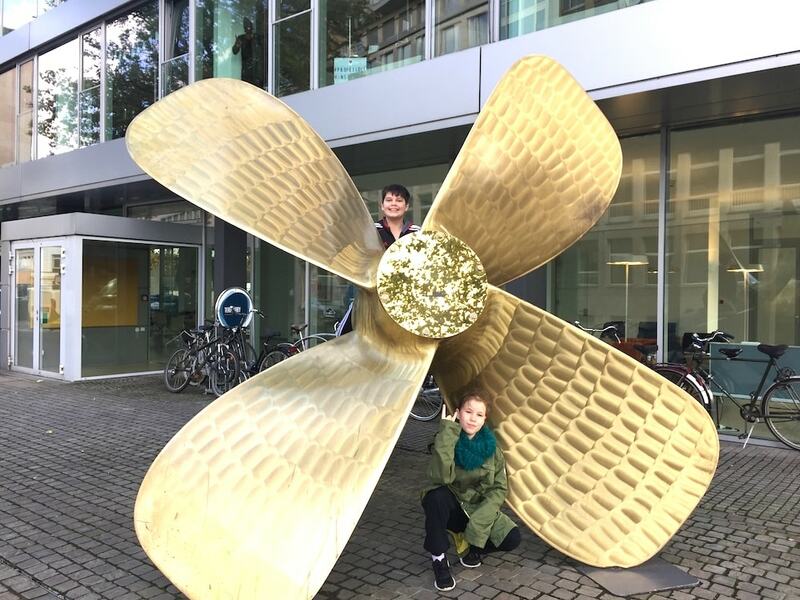 We came across numerous statues dotted around the city, along with a huge propeller (which offers a nod to Hamburg’s nautical past and present) and even a high water marker, which illustrated how high the North Sea flood of 1962 reached. 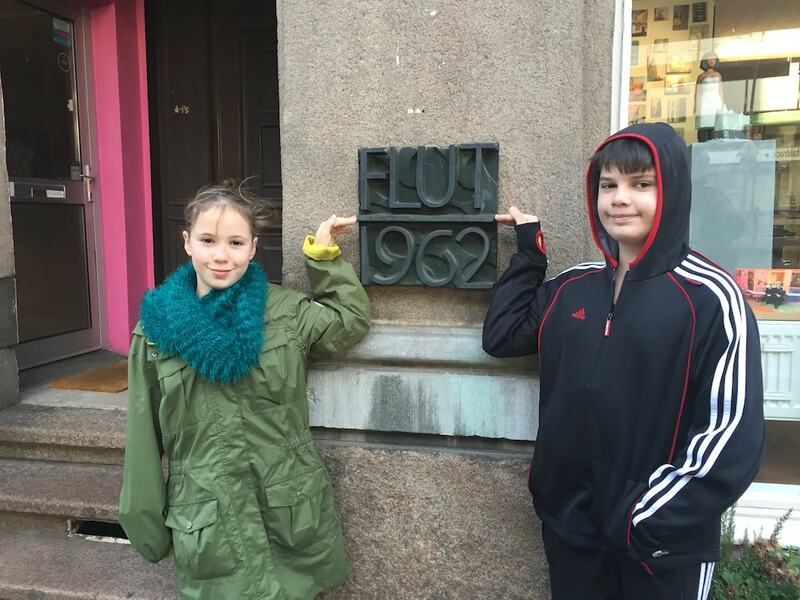 Discovering the high water marker led us to do our own research in the evening when we were back at our hotel (see, Hamburg’s sights can spark great educational discovery! ), and we discovered that the flood killed 315 people and destroyed 6,000 buildings. TOP TIP: Sit on the steps near the Town Hall to do some people watching. The kids loved this as much as we did and we ended up playing a game we made up ‘Spot the person who….’ (is wearing red shoes….is speaking on their phone….is walking really quickly etc…) – great fun! 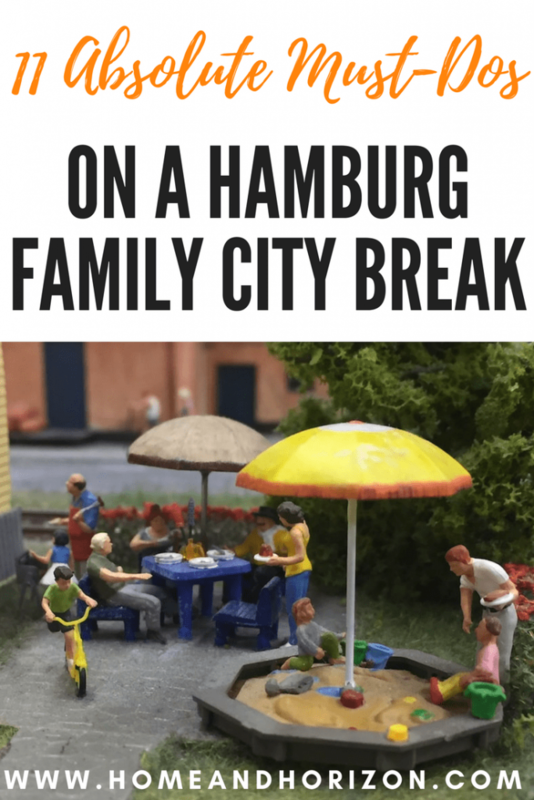 The city of Hamburg is just a short hour-and-a-half flight from the UK and is a great city to explore on a long weekend with the kids. At the time of writing, Skyscanner was promoting return fares from £18, making it a ridiculously cheap destination to reach. Airlines that serve the destination include BMI Regional, British Airways, Sun Air of Scandinavia, easyJet and Eurowings. Summer is probably the best time to visit the city, but we travelled in autumn and were lucky temperature-wise as it wasn’t too cold. However, if you do go in autumn or winter, take layers as the weather is quite changeable. For a family of four, we took 300 euros as spending money for the long weekend, which lasted for the holiday without compromising or feeling like we missed out. Which activities in the city appeal to you? *I took part in the #ComeToHamburg project in return for an honest look at what families can experience in the city. I would also love to say that a majority of people who end up devoid of medical insurance are typically college students, self-employed and people who are usually not working. Over fifty percent of the without being insured are under age of Thirty-five. They do not experience they are in need of medical health insurance since they are young and healthy. Their earnings are normally used on housing, food, in addition to entertainment. Some people which do go to work possibly entire or perhaps in their free time usually are not presented insurance by way of his or her work so they get along without with the growing expense of medical health insurance in the usa. Thanks for the ideas you write about by way of your blog. I hadn’t previously considered Hamburg but after reading this in adding to our wish list. That’s great to hear Lara, thanks. Glad I could whet your appetite Ren! Love the post!! I’ve been thinking about going there for our next family trip, it sounds so fun! Wow! Hamburg seems so awesome and an amazing travel destination, Lauretta. I would love to explore it more and enjoy all these suggestions. How many days would you recommend staying there? Thanks Agness – we stayed for three days and we had three full on days, so I’d say anywhere between a long weekend – or if you want to take things at a slower pace and just take in the main sights, then 4-5 days would be better. Hope you get to experience it one day! Your right it isn’t a city I would have thought of visiting but looks great. We had a city card like this when we visited Copenhagen and it was WELL worth it. I think most of the city cards offer similar deals – and yes, they are definitely worth getting as they do end up saving you a lot. Indeed such great tips. 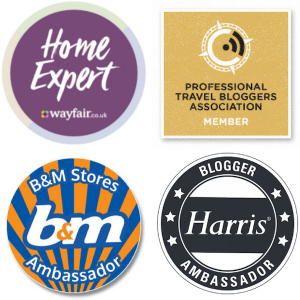 I suggest to do booking earlier and book on some sites where they offer discounts. 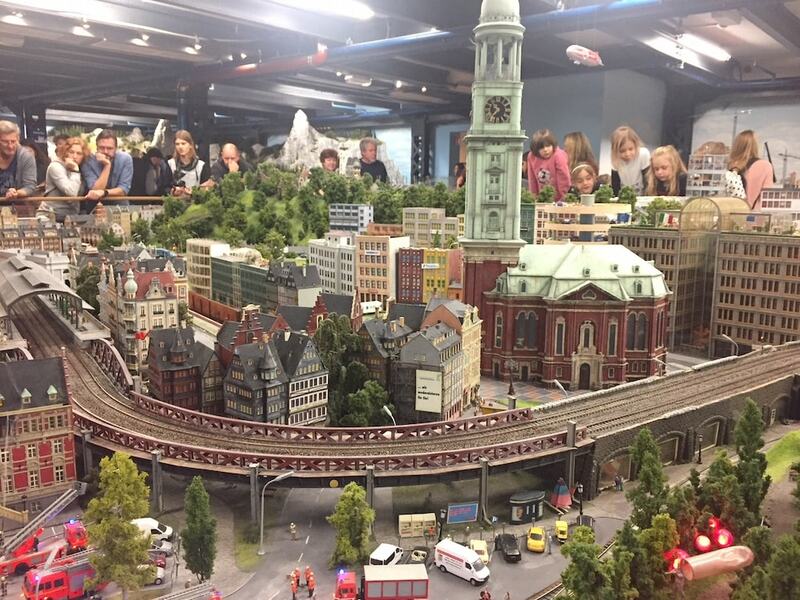 Also I would love to see the Miniatur Wunderland, might be a reason for me to revisit Hamburg. Great ideas Anosa – thanks! You should give it a go Kara – I’m sure your kids would love it! We have never had a family trip to hamburg but my husband has been there lately on a few stag dos and says it’s amazing! Ha ha! I hear it’s popular for stag dos! We tried to avert the kids eyes to some of the shop fronts while we were in the red light area. I’ve never been before it looks like there is loads to do! I love a bus tour and do this in new places we do in the UK and abroad! Thanks Laura – you certainly won’t get bored there that’s for sure. Hamburg sure does look like a lovely place for a family holiday. £18 for a return fare is fantastic. The chocolate museum sounds really good! The airfares are amazing aren’t they? 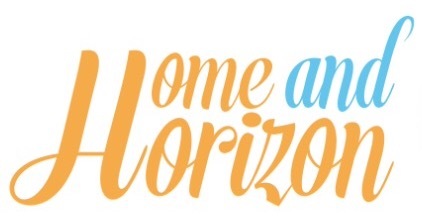 So affordable – and makes a destination even more attractive to visit! 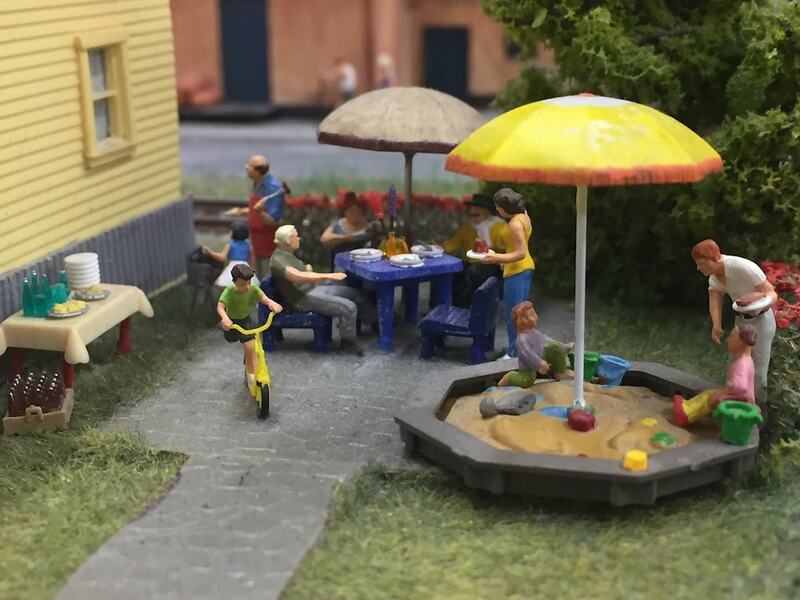 I’ve never been to Hamburg but looks like there’s lots to do for the whole family the Miniatur Wunderland looks wonderful and that chocolate museum – YES!!!! 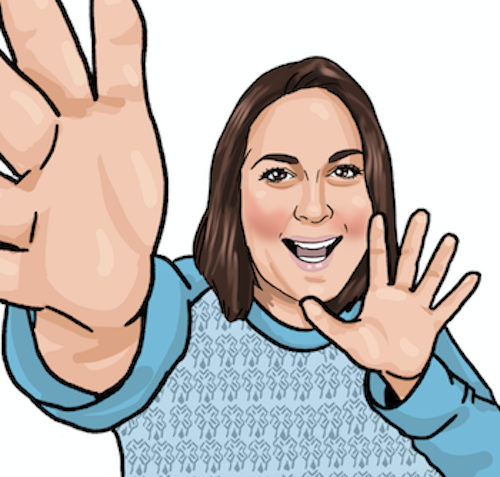 Thanks Helen – it’s so nice to be able to share my experiences and offer my opinion on what places are really like. 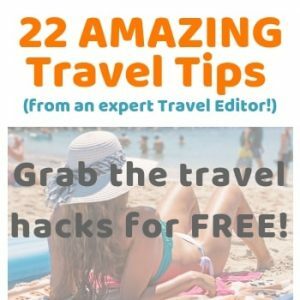 That’s a great list of tips. I’d never considered Hamburg as a holiday destination but you’ve shown there’s lots to see and do even with the kids in tow! 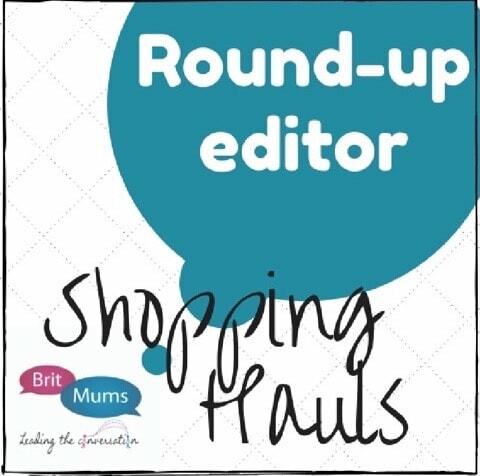 Thanks Cath – I was surprised at how much my kids enjoyed their mini break! Great tips. I think a bus tour is a must in any new city – it’s just the quickest way to see all the main sights and get your bearings. I used to work in Hamburg, but I’ve never visited as a tourist – I bet it’s very cool! 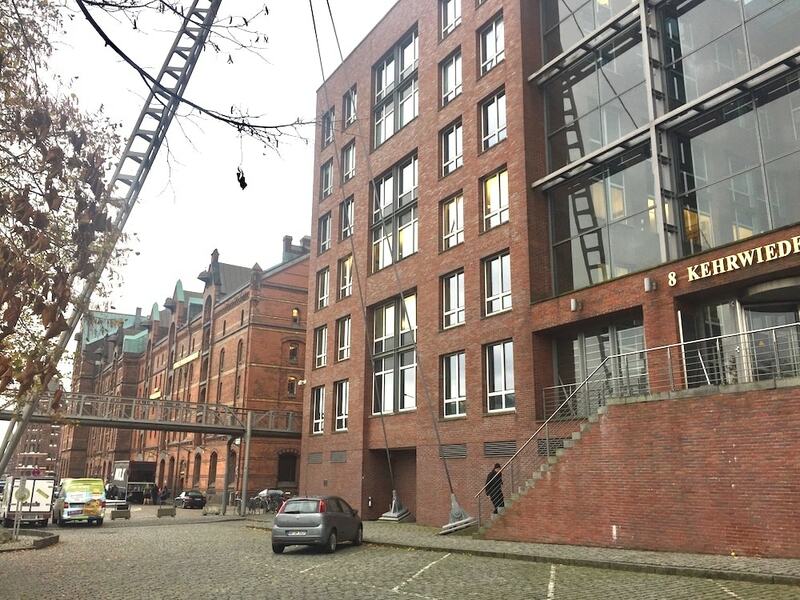 Can’t believe you used to work in Hamburg – what a great city to work in. Agree about the bus tour – I enjoyed it much more than I thought I would. We found the accommodation in Hamburg so expensive. We loved Miniatur Wunderland though, the boys were fascinated. We would definitely go back, a very interesting city.